Barbados (pronounced /bɑrˈbeɪdoʊz or bɑrˈbeɪdɒs/) is situated just east of the Caribbean Sea. It’s an independent West Indian Continental Island-nation in the western Atlantic Ocean. For over three centuries, Barbados was under British rule; it maintains Queen Elizabeth II as its head of state. Located at roughly 13 degrees North of the equator and 59 degrees West of the prime meridian, it’s considered a part of the Lesser Antilles. Its closest island neighbours are Saint Vincent and the Grenadines as well as Saint Lucia to the west. To the south, one finds Trinidad and Tobago—with which Barbados now shares a fixed official maritime boundary—and also the South American mainland. The Barbados dollar is the currency of Barbados. It was introduced in 1973 by the (then) newly created Central Bank of Barbados and replaced the dollar of the Eastern Caribbean. Since July 5, 1975, the parity has been fixed to the U.S. dollar at Bds$ 2 = US$ 1. Duty-free goods are available at low prices. You can buy local handicrafts, British woolens, tweeds, silks, perfume and straw goods. This easternmost Caribbean island sits on the edge of the Atlantic Ocean. The balmy, tropical climate is cooled by the continual trade winds blowing in from the east. The fresh breezes, warm sunshine, and sufficient rainfall make the year-round average daytime highs of 24 to 29°C very comfortable. Maintained in a protected environment, the Graeme Hall Nature Sanctuary is set in some 1,100 acres of lakes and woodland. Access to the Sanctuary’s resources has been well planned with visitors in mind - the walkways are paved and provide easy access to points of interest. It's an elegant Georgian building and is now the headquarters of the Garrison Committee of which Hartland is the secretary. The reason there were so many guns on the island was that during the 17th & 18th centuries Barbados was an important military base which the British used to protect their interests in the southern Caribbean. Two centuries ago, the formation of the Crane Beach’s protective coral reef permitted small trading ships to sail in and out and a small commercial port to develop. On the cliff where the Crane presently stands, was a crane used for raising and lowering cargo. The district is named after this crane. Flower Forest is a horticultural park and tourist attraction near the village of Bathsheba, in Barbados. It is a scenic park with attractive flowering plants and tropical trees. Brilliant in colour against a green backdrop and a waxy, almost plastic feel to them, they never fail to impress. The Animal Flower Cave is a tourist attraction located in Barbados' northern most parish of St. Lucy. It is noted for its underwater "flowers"" and a signpost indicating the directions to several other countries. 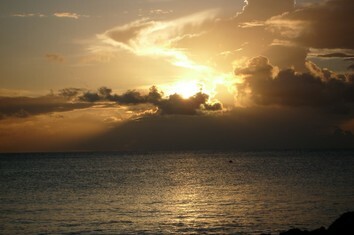 It is one of the main locations where the actual age of the island of Barbados has been studied." Enterprise Beach, near the town of Oistins, is a popular sandy beach in Barbados. It is located on the south coast of the island, with calm waters and brilliant sunset views. It is also a popular docking area for cruises onboard a catamaran. It has a beach shopping complex, and gardens and has been voted one of the Top 10 beaches in Barbados. Widely known as the "Sandy Lane"" beach, this stretch takes its name from the luxurious Sandy Lane Hotel which is nestled in the mahogany trees, directly off this beach. First opened in 1961, this magnificent hotel has gained a reputation as one of the finest resorts in the Caribbean, and has welcomed royalty, celebrities, and the business elite. " Barbados is dotted with the ruins of abandoned sugar mills which became uneconomical with centralized processing. The refinery buildings of Heritage Park were lovingly restored in 1996. Some of the buildings date back to the 17th century and are listed by the Barbados National Trust. Andromeda Gardens is a botanical garden and attractive tourist attraction in Barbados. It is a beautiful scenic park with strikingly attractive flowering plants and tropical trees and along with Flower Forest it is one of the most alluring parks on the island. It is named from the Greek mythological figure of Andromeda. Enjoying an afternoon at Sunbury Plantation on the island of Barbados in the Caribbean is an excellent getaway. Sunbury was built over 300 years ago and was once a thriving plantation. Today the house and grounds have been carefully restored and include an excellent collection of antiques, china, silver, furniture, and farm implements.